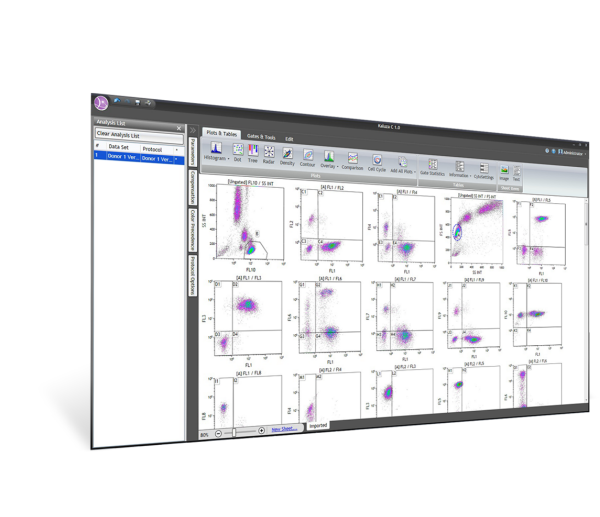 Kaluza C Analysis Software is a stand-alone program supporting data analysis from any Flow Cytometry Standard (FCS)-compliant file, regardless of the manufacturer. This software is listed with the FDA as a medical device supporting the compliance needs of the clinical flow cytometry laboratory. This full-featured high-performance package has improved processing capabilities, but also specialized functions for a clinical workflow. The robust QC reporting capabilities support instrument and assay verification records and streamline audit preparation activities. Master report layouts establish standardized reporting and save technician’s time in creating reports. The software integrates with the Laboratory Information System (LIS) and can export user defined statistics and graphs. For a one-time expense, own the current released version at the time of purchase in perpetuity. Academic discounted version.